The extent of food waste in America is a cause for serious concern. It is estimated that around 1,217 calories per person per day are squandered. A new study in the Journal of the Academy of Nutrition and Dietetics looks beyond the caloric value of food waste and focuses on the nutritional value of the food we throw away. Investigators found that discarded food contains large amounts of key nutrients like vitamin D, fiber, and potassium that could help people get the food they need to meet their daily recommended intake. In 2014, 14% of American households suffered from food insecurity and an additional 5% experienced a shortage of resources that forced them to skip meals or reduce their food consumption. Across the population, Americans are not getting the recommended intakes of certain nutrients including dietary fiber; calcium; potassium; and vitamins A, C, D, and E. At the same time, Americans continue to waste food at an alarming rate throughout the food supply chain. It’s estimated that 31-40% of the post-harvest food supply is discarded. This study was the first to demonstrate the substantial amount of nutrients, including many under-consumed nutrients, wasted due to food discarded at the retail and consumer levels of the U.S. food supply. Quantifying the loss can motivate related investments and support the case for registered dietitian nutritionist engagement with these efforts. The estimates can additionally serve as a baseline for tracking intervention impacts. 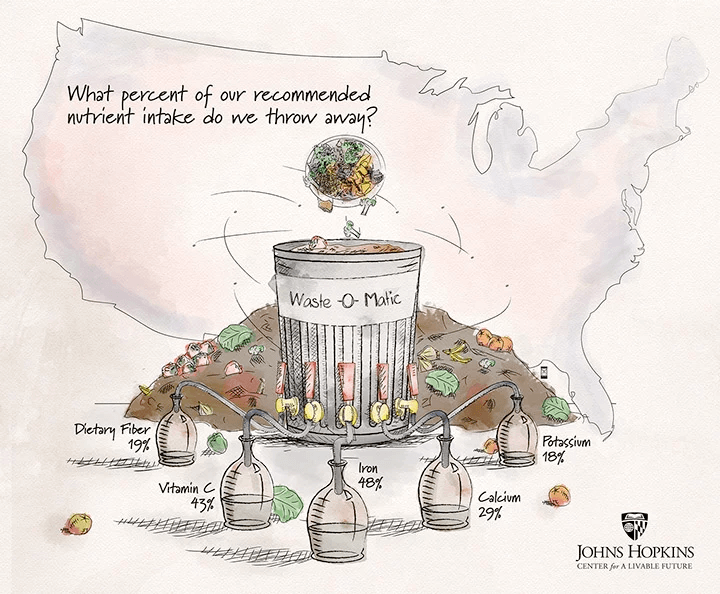 What percent of our recommended nutrient intake is discarded in the U.S.? Credit: Johns Hopkins Center for a Livable Future. Data from the National Nutrient Database for Standard Reference were used to calculate the nutritional value of retail and consumer level waste of 213 commodities in the USDA Loss-Adjusted Food Availability data series for 27 nutrients in 2012. The study, led by Roni A. Neff, PhD, Program Director at the Johns Hopkins University Center for a Livable Future (CLF), and Assistant Professor, Department of Environmental Health & Engineering, and Marie L. Spiker, MSPH, RD, CLF-Lerner Fellow and Doctoral Candidate, Department of International Health, Johns Hopkins Bloomberg School of Public Health, found that losses of under-consumed nutrients were significant. Food wasted at the retail and consumer levels of the U.S. food supply in 2012 contained 1,217 kcal, 33 g protein, 5.9 g dietary fiber, 1.7 mcg vitamin D, 286 mg calcium, and 880 mg potassium per capita per day. Using dietary fiber as an example, 5.9 g dietary fiber is 23% of the RDA for women. This is equivalent to the fiber RDA for 74 million adult women. Adult women in 2012 under-consumed dietary fiber by 8.9 g per day, and the amount of wasted fiber is equivalent to this gap for 206.6 million adult women. Data points like this highlight the need for diverse interventions including standardized date labeling (use by, sell by) and consumer education, so that people can utilize the nutrients instead of throwing them in the trash can. According to the authors, perishable foods such as fruits and vegetables are lost at particularly high rates, leading to exceptional losses of under-consumed nutrients. Changes to our food system can reduce agricultural and pre-consumer waste, and play an important role in shaping the amount of food consumers discard. Cultural shifts are also needed to change consumer and industry attitudes. Even if only the top seven most cost-effective food recovery activities were scaled up and only an additional 1.75% of food waste was recovered, this would translate into 2,000 calories per day for 3.3 million adults. The article is “Wasted Food, Wasted Nutrients: Nutrient Loss From Wasted Food in the US and Comparison to Gaps in Dietary Intake,” by Marie L. Spiker, MSPH, RD, Hazel A.B. Hiza, PhD, RD, Sameer M. Siddiqi, BS, Roni A. Neff, PhD, ScM (http://dx.doi.org/10.1016/j.jand.2017.03.015). It will be published in the Journal of the Academy of Nutrition and Dietetics, volume 117, issue 7 (July 2017) by Elsevier and is openly available. Full text of this article is available to credentialed journalists upon request. Contact Eileen Leahy at +1 732-238-3628 or andjrnlmedia@elsevier.com to obtain copies. Journalists wishing interview the authors should contact Natalie Wood-Wright, Director of Public Affairs, Johns Hopkins Center for a Livable Future, at +1 443-287-2771 or nwoodwr1@jhu.edu. An accompanying video is posted at www.jandonline.org/content/podcast.